Heat pipes today find many applications, in areas such as electronics cooling, diecasting and injection moulding, heat recovery and energy conservation, de-icing, and manufacturing process temperature control. 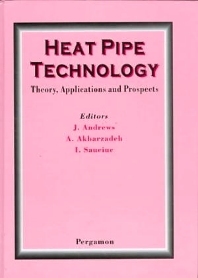 Heat Pipe Technology: Theory, Applications and Prospects contains the proceedings of an important international gathering of those at the cutting edge of research in the field, with representatives of more than 20 countries. In addition to the finest technical papers, a particularly valuable feature is the inclusion of a series of regional surveys portraying the latest developments worldwide. The inherent characteristics of heat pipes (passiveness, absence of moving parts, high thermal efficiency) suggest for them an increasingly major role in the evolution of new thermal engineering systems in the years ahead. This volume will undoubtedly be an important resource for researchers worldwide in heat pipe technology. Chapter headings: Technical Overview and Regional Surveys. Fundamental, Theoretical and Experimental Studies. Cooling of Electrical and Electronic Systems. Performance Prediction and Modelling. Heat Pipe Heat Exchangers. Heat Pipe Applications. Loop Heat Pipes. High Temperature Heat Pipes.